Posted on Mon, Dec 10, 2012 : 5:57 a.m. The Tanner Libraray on the first floor of Angell Hall on the central campus of the University of Michigan in Ann Arbor. As finals approach at the University of Michigan, students are on study overload. According to the 2012 National Survey of Student Engagement, first-year college students studied an average of 14.9 hours a week during the semester and college seniors spent an average of 15.5 hours per week studying and preparing for class. Students usually look for different components when studying. Some like absolute silence, while others prefer the hum of ambient noise and distant chatter in the background. Some like to study alone; others want a crowd around them. 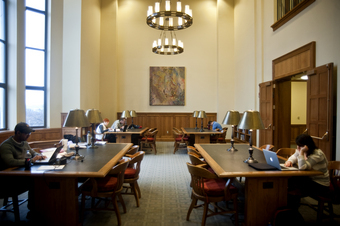 Whatever the preference, AnnArbor.com is featuring eight great study spots for students hitting the books and cramming for finals. 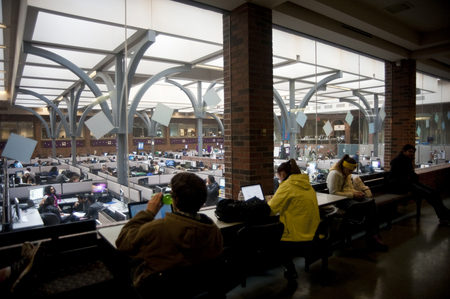 U-M final exams and days earmarked for studying take place from Dec. 12-20. This list represents just a handful of several great places to study on campus, so feel free to add your favorite spot in the comments section below. Also, take a look at last year's featured study spots. The 'Fishbowl' in Angell Hall on University of Michigan's campus. More commonly known as the 'fishbowl,' this is perhaps one of the most popular places to study and do classwork on campus. It's the largest computing site on campus and contains more than 135 computers and 18 printers for student use. Since it's very busy, there's usually a lot of ambient noise in the background. If being in the company of other students inspires you to study harder than you would otherwise, study here. Location: 444 Mason Hall. It is the large courtyard within the Angell Hall and Mason Hall joint building on central campus. Hours: The fishbowl is open nonstop from Sunday at 10 a.m. until 11:30 p.m. Friday. On Saturday's it's open from 10 a.m. until 11:30 p.m. Closest coffee or snack option: Nearby is the Michigan Union, which has a coffee shop and plenty of fast food options. There's also plenty of coffee and quick eats along State Street. The Art Lounge on the first floor at the University of Michigan Student Union on the central campus of the University of Michigan in Ann Arbor. If you're easily distracted, this might not be the best place to study. But if you like music playing in the background when you study, then hit the books here. 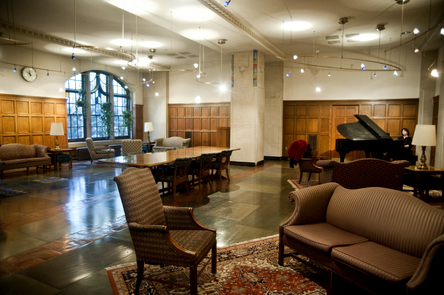 This room is filled with comfy chairs and tables for studying, but it also includes a piano that students practice on regularly. For a certain kind of studier, the live piano music could provide just the right backdrop for a unique and productive study session. If the music becomes too distracting, you can go across the hall to the Union's quiet study room. 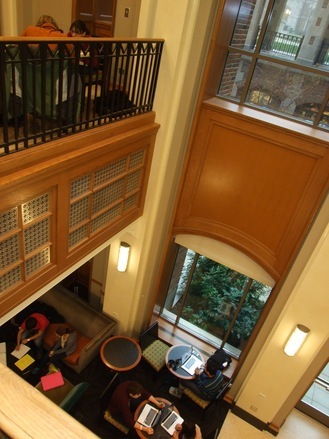 This area is best for individual study, but you can always schedule a group meeting in Amer's Café, also in the Michigan Union. Location: Michigan Union, 530 S. State St. Hours: Monday through Saturday 7 a.m. until 2 a.m.; Sunday 9 a.m. until 2 a.m. Closest coffee or snack option: There's a coffee shop, convenience store and several fast food options in the building. 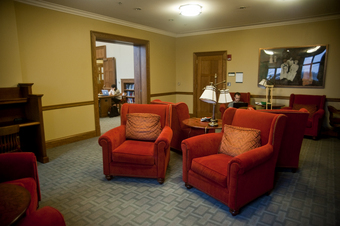 The Gerald R. Ford Public Policy school reading room. A steady flow of students use this room during the day, especially during finals. The spot is classic Michigan, with huge windows illuminating wooden study tables and bookshelves lining the wall. There's also a cluster of orange upholstered chairs with lights for reading. 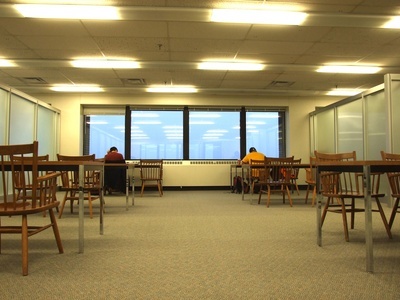 This isn't a great place for group study, but it is quiet and provides the company of fellow studiers that many seek. The reading room is open to students from any college. Location: Third floor, Weill Hall, 735 S. State St. Hours: Daily, 7:30 a.m. until 7:30 p.m. for U-M students and 24-hour access for public policy students. Closest coffee or snack option: There's a snack machine on the first floor of the building and a couple of fast food restaurants nearby at the intersection of Hill and State streets. Students study at Beanster's Cafe in Michigan League. Michigan League is a great place to study because it has the best of nearly all worlds. 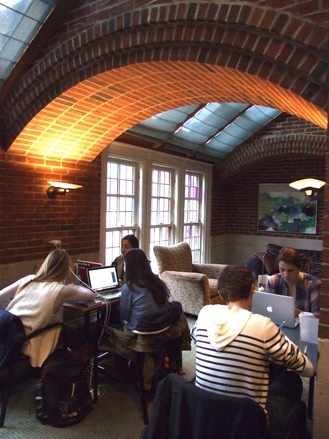 Beanster's Cafe, a coffee shop on the first floor flooded with light from the League’s stained glass windows, is a great place to snack and study, either independently or with classmates. 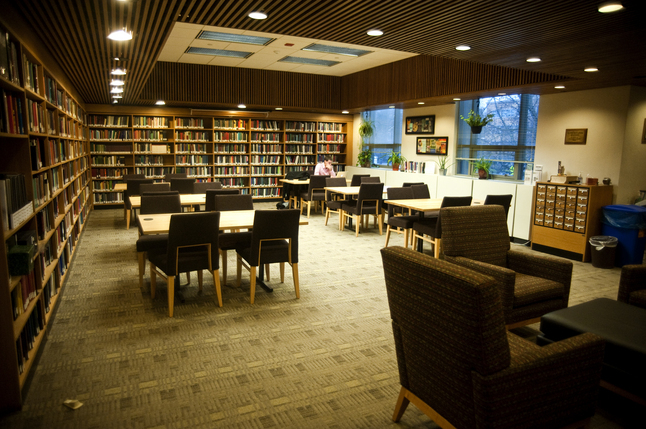 If you’re looking for more solitude, but you still like the buzz of people, the first-floor common areas have comfortable couches and tables that are often occupied by fellow studiers. Want to be alone with your books? Just climb the staircase to the second floor and take advantage of the rarely used sitting areas there. Location: 911 N. University Ave. Closest coffee and snack option: Beanster's Cafe is on the first floor. Additionally, a variety of fast food restaurants operate in the basement and there's a snack shop on the first floor. University of Michigan students study alone and in groups on a recent afternoon at the North Quad Media Gateway. This is the perfect place to study for someone who likes quiet, but doesn't like being completely alone when studying. The two-floor media gateway is dotted with chairs and tables for studying, is flanked by huge windows and has an open floor plan. North Quad, home to the School of Information, opened in 2010. Working with a group? No problem. There are four rooms on the first floor where students can hash-out group projects. The rooms are available on a drop-in basis and some offer laptop connections and white boards for collaboration. Location: North Quad, 105 S. State St. Hours: Daily, 7 a.m. until midnight. Closest coffee and snack option: There's a dining hall located in North Quad and several coffee shops, including Starbucks and Espresso Royale, nearby on State Street. This little library tucked in the corner of an Angell Hall corridor is a little-known gem and great place for studying. It's an endowed philosophy library, so, if you need a break from studying you can leaf through the thousands of philosophy books lining the halls. There's tables with upholstered chairs for studying and a few computers for public use if you don't have your own. It's usually pretty quiet in here, so this library is best for individual study. "It's nice and warm and no one knows about it, and it's quiet," said librarian Molly Mahony, who said select studiers are "very dedicated" to the library and study in it often. Location: 1171 Angell Hall; 435 S. State St. Hours: Hours vary depending on day. Check here for more detail. Closest coffee or snack option: Nearby is the Michigan Union, which has a coffee shop and plenty of fast food options. There's also plenty of coffee and quick food along State Street. Students study in the Hatcher Graduate Library's quiet study room, located in the special collections area on the library's 8th floor. Do you like your study spots to be so quiet a literal drop of the pen is a disturbance? 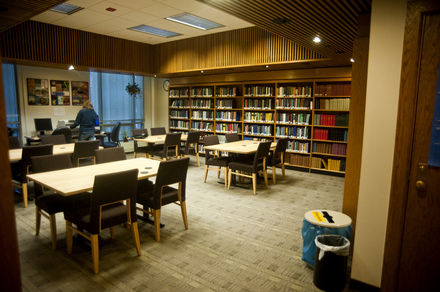 Then study in this area within the university's special collections library on the eighth floor of Hatcher. Adorned with simple tables and wooden chairs and with a great view of Ann Arbor, this no-frills room is perfect for the studier that has trouble focusing if there's noise. Location: 8th floor of Hatcher Graduate Library, located on the Diag. Hours: Hours vary depending on day. Read more here. Closest coffee or snack option: There's a cafe nearby in the undergraduate Shapiro Library. The William L. Clements Library just off of South University on the central campus of the University of Michigan in Ann Arbor. 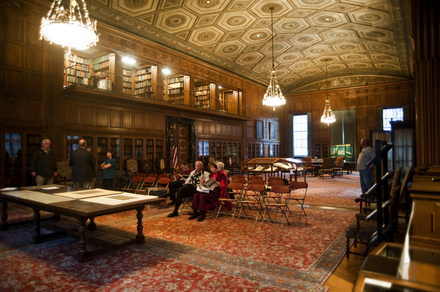 Clements Library houses one of the oldest collections of American history in the world, but unbeknownst to many students, it also has a great atmosphere for studying. The main hall has seating areas students can use for reading. It's usually not busy. This is another place that's good for individual study. Location: 909 S. University Ave. Hours: Listed as Monday through Friday (excluding Thursday) 9 a.m. to 4:45 p.m.; Thursday 9 a.m. until 7:45 p.m. Closest coffee or snack option: There's an Espresso Royale and several restaurants nearby on South University. Mon, Dec 10, 2012 : 10:28 p.m. Please note that hours for the Clements Library &quot;Main Room&quot; are from 1:00 pm to 4:45 pm Monday through Friday. The hours listed in the article are for the researchers' reading room for people registered as &quot;readers&quot; with the Library and using the original documents and materials in the Library collections. Mon, Dec 10, 2012 : 10:25 p.m. I know of an event called &quot;The Final Fix&quot; @ University Lutheran Chapel/Common Cup Coffee. Dec 12 from 8p-2a (including breakfast), too. Mon, Dec 10, 2012 : 8:41 p.m.
Mon, Dec 10, 2012 : 8:50 p.m. Sorry, I meant to have said 10am for all of those opening times, rather than 9am. Mon, Dec 10, 2012 : 8:01 p.m.
As a recent U-M grad, I have to say: pub pol is the best! It's super quiet and low key. The fishbowl? Absolute worst. It's a zoo. Mon, Dec 10, 2012 : 1:44 p.m.
Great article. Students do seem to study more now than in the past, especially on weekend evenings. Mon, Dec 10, 2012 : 1:37 p.m. Brings back happy memories. But, ~15 hours a week? That is per class, right? Mon, Dec 10, 2012 : 1:32 p.m. Things change. 15 hours a week? Isn't that supposed to be the number of hours spent the night before ? Mon, Dec 10, 2012 : 2:33 p.m.
Mon, Dec 10, 2012 : 1:54 p.m. According to the NSSE report, that's 15 hours overall- although I am sure students have their nose in the books at a higher rate during finals. If you click on the link to the report (in article) the summary includes a breakdown of average study times by major. Mon, Dec 10, 2012 : 1:11 p.m.
Mon, Dec 10, 2012 : 1:50 p.m.
We did mention the Dude in our last list: http://www.annarbor.com/news/eight-great-places-to-study-on-university-of-michigans-campus/ I am thinking of possibly putting together an edition featuring North Campus spots next semester. Thanks for listing your favorites. Mon, Dec 10, 2012 : 12:42 p.m.